Ephesians 4:12-24 contains many positives: perfecting, building, oneness, full-grown, fullness, truth, love, reality, righteousness, holiness. These characteristics do not refer to the natural realm or from natural effort. They all come from being in Christ, learning Christ, hearing Christ, and growing up into Him as the Head of the Body. Because these all are Christ and our experience of Him, they are also characteristics of New Jerusalem. Ephesians 4:12-24 also contains many negatives: sleight, craftiness, error, vanity, darkness, ignorance, hard-ness, lasciviousness, uncleanness, greediness, corruption, deceit. These all result from mankind being alienated from the life of God. None of these will be in New Jerusalem nor anywhere in the new creation, except in the lake of fire. In our daily living, the key for us as believers to get away from the negatives and into the positives is verse 4:23, “be renewed in the spirit of your mind.” The Spirit has regenerated our spirit—this is John 3:6, “that which is born of the Spirit is spirit.” Now we are one spirit with the Lord—this is 1 Corinthians 6:17. These two steps—regeneration and renewing—are also seen in Titus 3:5, “the washing of regeneration and the renewing of the Holy Spirit.” This renewing is not a change from bad behavior to good behavior. Rather, it is a change from living in the old humanity, the fallen humanity that is apart from God to living Christ and letting Him become the reality of our human virtues. This is a living that corresponds to New Jerusalem. Ephesians presents the eternal love of the Lamb, Jesus Christ, and His wife, the New Jerusalem (Rev. 21:9-10). Ephesians 1 and 2 focus on God’s love to us. Chapter 3 begins to set forth our experience of this love. Chapter 4 begins with an exhortation to walk worthily of God’s calling (4:1*). The first step in this walk is “with all lowliness and meekness, with long-suffering, bearing one another in love” (4:2). This is not our own love. Instead, as stated in 1 John 4:19, “We love because He first loved us.” This love maintains us in the oneness (4:3). To no longer be tossed about as children (4:14) we need to grow into Christ in everything by holding Him, the reality, in love (4:15). As we grow into Him, a rich supply flows out from Him for “the growth of the Body unto the building up of itself in love” (4:16). The building up of the body of Christ, in love and by the rich supply flowing out from the Head, is part of the preparation of the bride of Christ. Both the body and the bride are living compositions of all His believers. By the rich supply we are not only “joined together” but even more “knit together” (4:16). In New Jerusalem we will be “no longer little children,” nor “tossed about,” but fully knit together, grown to maturity, and built up in love. Being perfected and growing to maturity are two closely related aspects of our Christian life. When we become mature and are perfected, we match New Jerusalem. In 1 Corinthians 3:1-3 Paul expresses concern about the Corinthians remaining “infants in Christ.” He desired that they grow. Likewise, Hebrews 5:12 expresses concern (sadness?) that the believers were spiritually young children. Then 6:1 urges, “let us be brought on to maturity.” Let us grow until we match New Jerusalem. 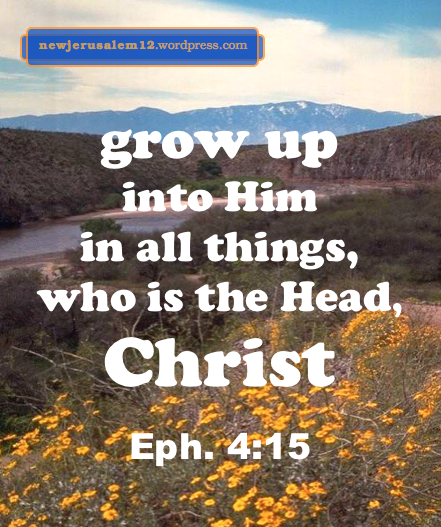 Likewise, the desire in Ephesians 4:14-15 is that “we may be no longer little children” but that “we may grow up into Him in all things, who is the Head, Christ.” We grow up into Christ. This implies that we grow out of our self, out of our culture, and out of everything natural. We grow out of the old creation to match New Jerusalem in the new creation. In Colossians 1:27 Christ is in us as our hope of glory, our hope of participating in the glory of New Jerusalem. In 1:28 Paul tells us that his announcing of the indwelling Christ has the goal to “present every man full-grown in Christ.” Sooner or later every believer will be full grown in Christ and will share in New Jerusalem. This growth is not anything outward. Spiritual growth is not measured by physical years as a Christian, not measured by quantity of activities, not measured by knowledge or eloquence. 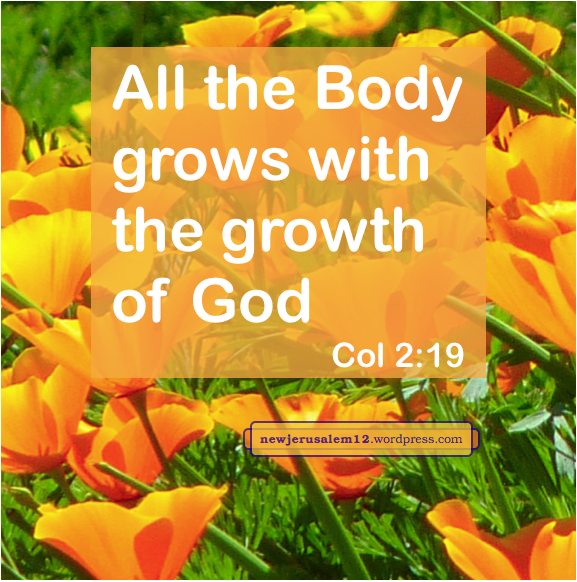 Rather, as members of the Body of Christ, we “grow with the growth of God” (Col. 2:19). God, in Himself, is perfect; He does not grow. But in us God needs more room, more flexibility, to grow, to spread, especially in our thinking, our emotions, and our decisions. Lord, increase in these aspects of my being! 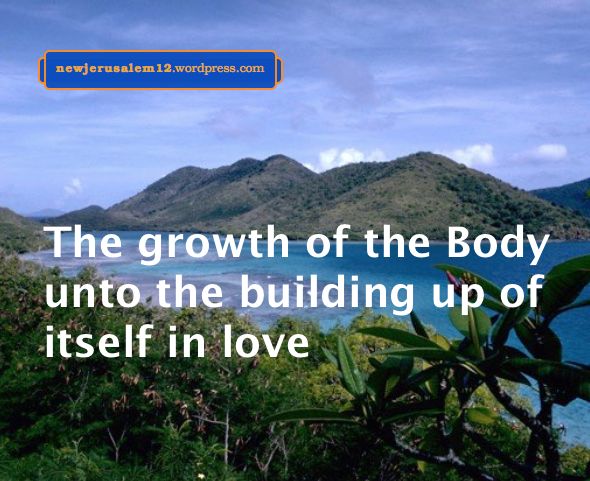 New Jerusalem is the consummation of God’s growth in His people and His people’s growth into Him. God’s unsearchable riches will be displayed through New Jerusalem. These riches are not only for New Jerusalem; they are for us to experience in our Christian life now. God’s rich mercy and kindness brought salvation to us. 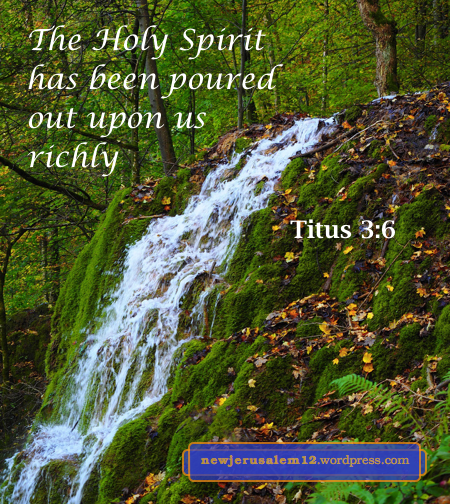 And the Holy Spirit has been “poured out upon us richly through Jesus Christ our Savior” (Titus 3:5-6). 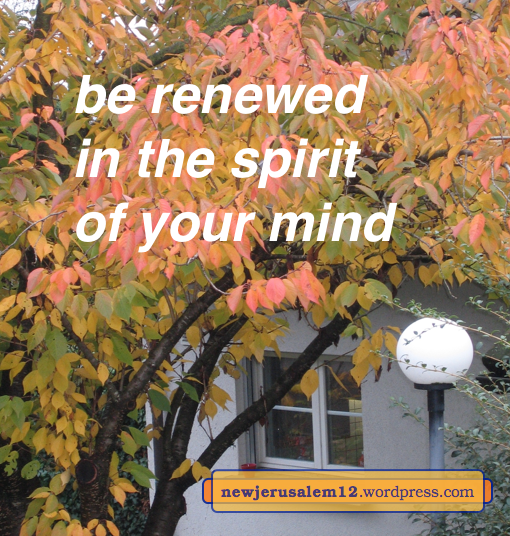 By this Spirit in us we have a daily renewing. 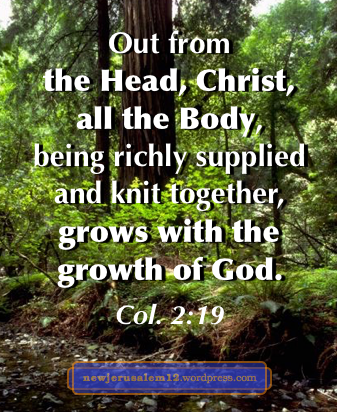 As the Spirit imparts the riches of Christ into us, our hearts are “being knit together in love and unto all the riches of the full assurance of understanding, unto the full knowledge of the mystery of God, Christ” (Col. 2:2). Like prior verses, here we see that there is no separating the riches from the Person of Christ. We can also “Let the word of Christ dwell in you richly in all wisdom” (Col. 3:16). This dwelling helps, and is helped by, “singing with grace in your hearts to God.” Even in New Jerusalem, Christ, the living Word, will be dwelling in us. I believe that in New Jerusalem we will still be singing with grace to God. Besides singing now, it is also good to pray and praise with the word. Furthermore, we can call on the name of the Lord. Whether almost silently or very loudly, we can call O Lord Jesus. “There is no distinction between Jew and Greek, for the same Lord is Lord of all and rich to all who call upon Him” (Rom. 10:12). All these Christian practices keep us holding our Head, Christ, and growing up into Him. This bring us to the building up of the Body of Christ by the rich supply out from Him (Eph. 4:15-16, Col. 2:19). This present, living building up is for New Jerusalem, God’s eternal building. Bible verses quoted in these posts are from The Holy Bible, Recovery Version, published and © by Living Stream Ministry, Anaheim CA, 2003. 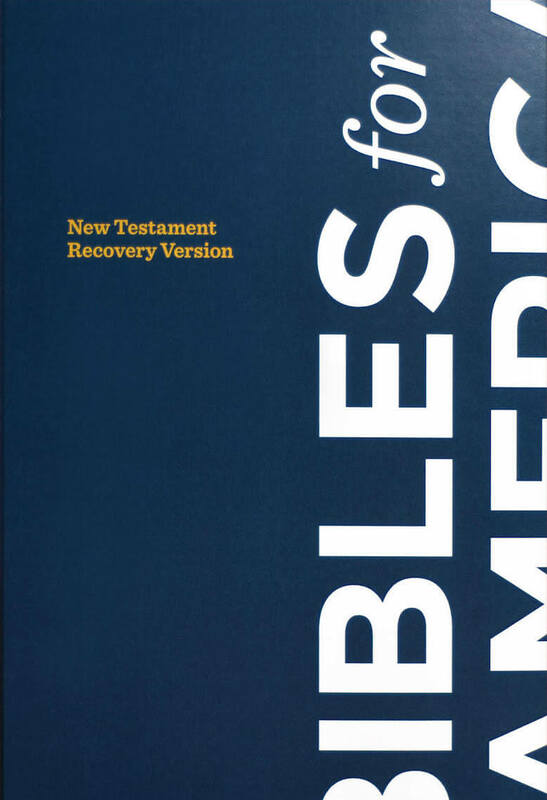 The New Testament of this Bible, with outlines, footnotes, and cross-references, is at online.recoveryversion.org; this too is © by Living Stream Ministry. Besides this New Testament, many books published by Living Stream may be read online. God’s spiritual blessings to us are all in Christ. We are in Him and He is in us. This mutual indwelling characterizes New Jerusalem. We are on earth for God’s good pleasure. Eternally He has a purpose in Himself which He has now revealed (Eph. 3:3-5). We are here because of Him and for Him. He cares for us, but we should never think that this is the goal of life. God’s good pleasure is not just for now. His economy (His way of working out His plan and achieving His goal) is for the fullness of the times, the ages. The Bible reveals that New Jerusalem is the consummation of these ages. 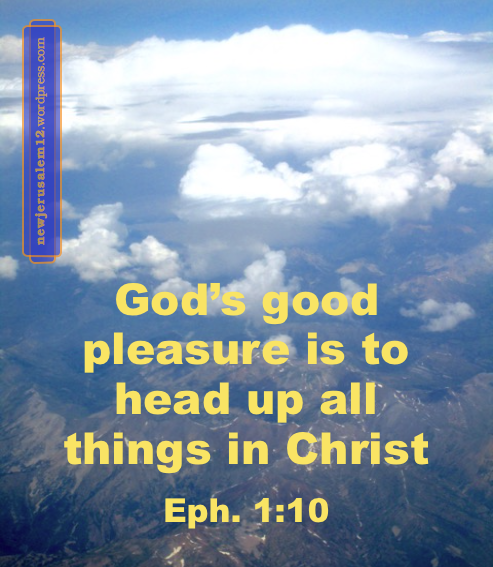 For New Jerusalem, and for the righteousness and peace which will distinguish the new heaven and new earth, God will head up all things in Christ. The heading up eventually will include not only New Jerusalem but also everything in the heavens and on earth. Right now, Christ is “Head over all things to the church, which is His Body” (Eph. 1:22-23). Right now He is working to head us up, to be the practical Head in our daily living. Ephesians 4:15 charges us to hold onto Him as the reality that “we may grow up into Him in all things, who is the Head, Christ.” Lord, train me to take You as my Head in daily life. This is our participation in the unseen new creation now leading to the visible new creation with New Jerusalem as its center. The holy of holies is where God meets with us. The Old Testament holy of holies was a physical picture, with an enlargement from the tabernacle to the temple. The New Testament holy of holies is the reality, the dwelling place of the living God, which is being enlarged to New Jerusalem. God in Himself is perfect, complete; He does not grow. But in us He needs to grow, to spread, to occupy more of our inner being. Today the church is the living house of the living God. In the future New Jerusalem will be the living city of the living God. The growth of God in all His people is the increase of His house from the church today to New Jerusalem. The key to this growth is our holding to Christ as our Head, as our life, and as the reality of all the Old Testament types and pictures (Col. 2:16-17). The more Christ our life increases in us, the closer we are to the fullness of New Jerusalem. * Notes (online) in The Holy Bible, Recovery Version, www.recoveryversion.org, published and © 2003 by Living Stream Ministry. This verse tells us, the believers in Jesus Christ, that we are the house of God. God’s house today is a living composi-tion of all the believers. Likewise New Jerusalem will be a living composition of all God’s people throughout the ages. 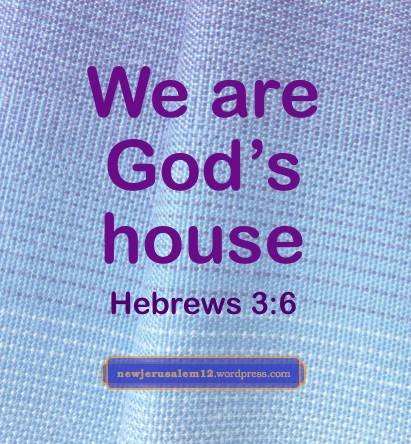 Hebrews 3:6, like many other verses in recent posts, is a strong demonstration that the house of God is not a physical building. Yes, physical buildings are very useful for Christians to gather in, but they are not the house of God. Christians collectively are the house of God; combined with God’s Old Testament people, we will be New Jerusalem. God is living. We match Him as the living house while we “hold fast the boldness and the boast of hope firm to the end.” Our boldness and boast is who Christ is, what He has accomplished, what He is doing now, and what He will manifest in the future. To hold our boast and hope is to hold Christ as our Head (Col. 2:19). By holding Him a rich supply flows out to His Body. This supply causes the Body’s growth unto maturity. The maturity of God’s living house will bring forth God’s living city, New Jerusalem. Paul’s seeing of the Body of Christ and the New Man reveal much about New Jerusalem. Following Romans, 1 Corinthians, and Ephesians, we come to Colossians. 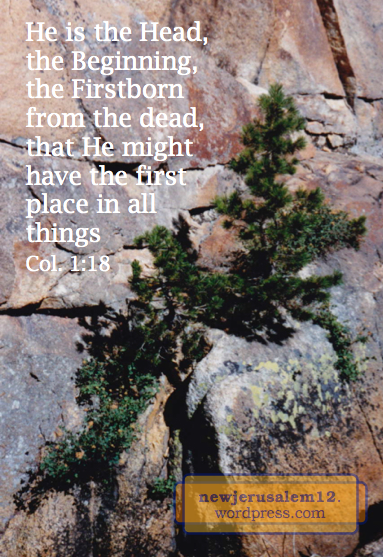 • “He is the Head of the Body, the church; He is the beginning, the Firstborn from the dead, that He Himself might have the first place in all things.” (1:18) Let us give Him first place in us! • Paul rejoiced “in my sufferings on your behalf and fill up on my part that which is lacking of the afflictions of Christ in my flesh for His Body.” (1:24) The sufferings for the Body are also part of the preparation of New Jerusalem, but in eternity there will be no sufferings. • We are “holding the Head, out from whom all the Body, being richly supplied and knit together by means of the joints and sinews, grows with the growth of God.” (2:19) This, parallel to Ephesians 4:15-16, is related to the preparation of New Jerusalem. • We “have put off the old man” and “have put on the new man.” (3:10-11). This matches Ephesians 4:22, 24. • “Let the peace of Christ arbitrate in your hearts, to which also you were called in one Body; and be thankful.” (3:15) Peace is of Christ and He is making home in our hearts. Thank Him! As in the prior books, all of these characteristics of the Body and New Man seen in Colossians apply to New Jerusalem. Christ has the first place in the city and He is its peace. The city is absolutely of the new man, with nothing of the old man. Finally, New Jerusalem is full grown, mature, in Christ. 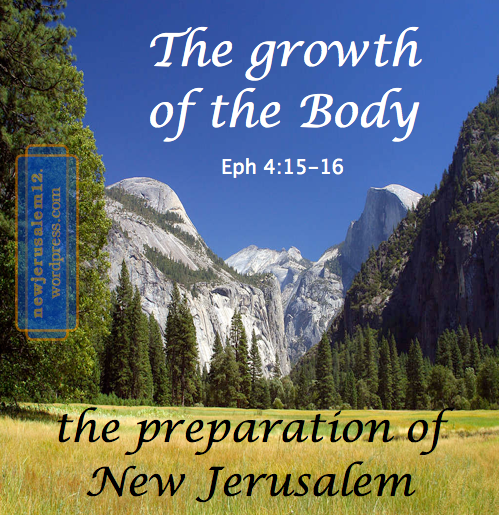 Paul’s seeing of the Body of Christ and the New Man show us much about New Jerusalem. The prior post touched verses in Romans and 1 Corinthians. Now Ephesians. • “The church which is His Body, the fullness of the One who fills all in all.” (1:22b-23). The Body now, and New Jerusalem eternally, is the fullness, the enlarged expression of the Christ who fills everything. • Christ died to create diverse peoples “in Himself into one new man” and to “reconcile both in one Body to God through the cross.” (2:15-16) The doing is His and the realm is in Him. • We all are “fellow heirs and fellow members of the Body and fellow partakers of the promise.” (3:6) Everything in Christ is shared among us all. 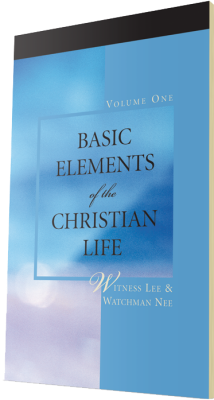 • “One Body and one Spirit.” (4:4) The Spirit is indispensable for the reality of the Body. • By holding the Head we grow up into Him; as a result, by the supply flowing out from the Head “all the Body…causes the growth of the Body unto the building up of itself in love.” (4:15-16) Ephesians 4 shows that all of us participate in the building up which is the preparation of New Jerusalem. All of these characteristics of the Body and New Man apply to New Jerusalem—the city is the fullness of Christ, coming out of His death and resurrection, we are all one in Him, we all share in all the blessings, and we all participate in the preparation.